Well now that school has started both Fiona and Alexa have nasty colds. I have also gotten a cold so I have not been very productive this past week. I decided to post some pictures of some previous cross stitch projects that I have done. 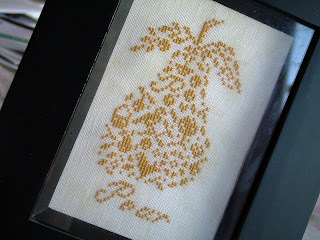 Fittingly enough, I completed this Pear Sampler in the Spring of 2007. I believe the pattern is by JBW Designs and it came from the Spring 2007 issue of Just Cross Stitch magazine. It hangs in our living room now. I thought it was appropriate to post being that we have picked a ton of pears this year. I have started a cross stitch for my sister for our birthday in November and I have finished the matching redwork piece to the Live Simply one I finished last week. I will have pictures of both soon. This week however, the number one project is Halloween costumes! Fiona wants to be a cheerleader and Alexa wants to be a monkey. Have a great week. I completed this sampler a couple of years ago. The pattern was free and came from Thea Duseck at www.victoriasampler.com The website is a wealth of information on crosstitch and needlework. There are lots of free patterns, tips, techniques, and cyber classes. 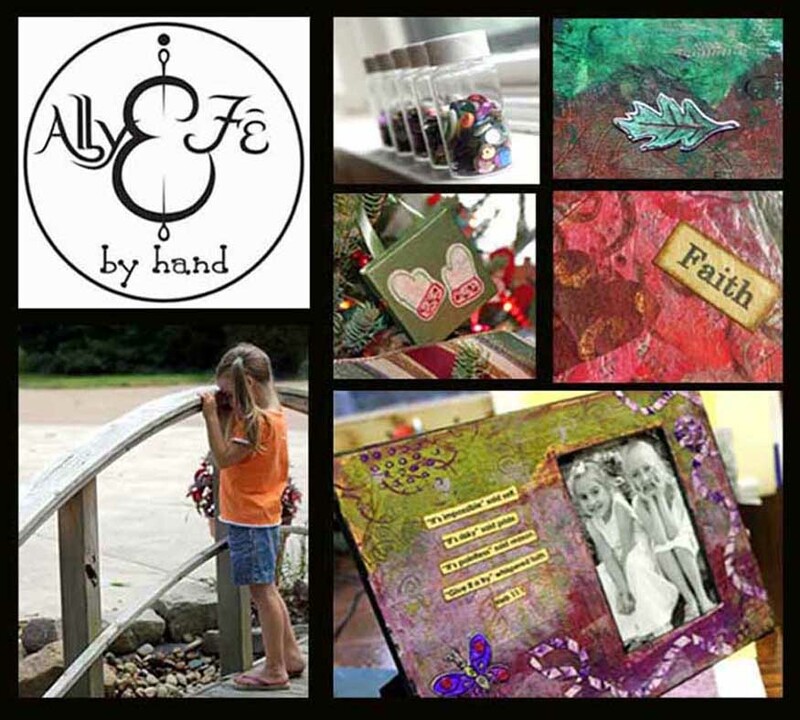 They also have an online store that is fantastic. 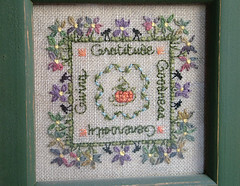 This mini sampler was stitched on 32 count linen and measures about four inches square. There are several different stitches in the sampler besides cross stitch. This happens to be one of my favorite pieces that I have stitched. It just screams fall, Thanksgiving, a little Halloween, all rolled in to one. Hope you enjoy looking at it. 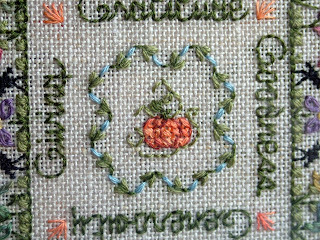 I finished this little pumpkin sampler in the fall of 2006. This was my first attempt at things like lazy daisy stitches and petite cross stitches. This was also my first time stitching with silk thread. It was hard to get used to as it was much slicker than cotton thread! I also paid to have this professionally framed-first time for that too. I was so pleased with the way that it turned out that I decided the $40.00 it cost me to have it framed was worth it. I would love to learn how to frame things well some day. Framers really do have a skill that takes a lot of patience and practice. 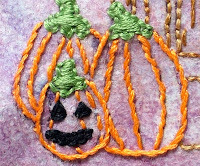 I have FINALLY finished my embroidered Halloween picture. I actually finished the embroidery about a week ago but it has taken me this long to finish the frame. 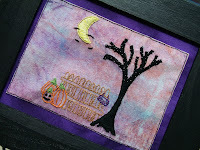 I am still not finished with the frame; my goal is to needle felt a couple of candy corns and put them on the frame. Hopefully that will get done before next Halloween! The fabric I used to mount the embroidery on is actually a very rich purple but I think it is looking a little more blue in the picture. 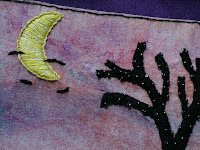 I used Mill Hill 4mm glass seed beads on the tree and Krienek Braid number 4 for the sparkle in the moon. This was a lot of fun to stitch, it took me a little longer than I would have liked but I am pleased with the result. On a bittersweet note we lost our barn on our property last night. We had high wind here in Ohio yesterday (remnants of Hurricane Ike if you can believe it) with wind gusts at the property of up to 70 mph. Now the good news is that all that was up was the skeleton of the barn, but it is no more... I'm grateful that it was our half built barn and not someone's house. Hope everyone has a good week! Pumpkins are pumpkins, there is nothing all that difficult in the stitching, just a basic stem stitch. HOWEVER, I can tell you that I re-did Mr. Jack-O-Lantern's face several times. I had a really hard time getting it to look like a face and not just like a group of black blobs. The other two pumkins were originally going to have faces too, but after the first one I decided that if I wanted to get it done by this Halloween, they were going to have to just be plain pumpkins. I have a book on embroidery from the Royal School of Needlework that is just fascinating. I got it as a Christmas present a couple of years ago. The section on Blackwork was amazing (if I have the time I will post some pictures of the book). I finally decided to give Blackwork a try. 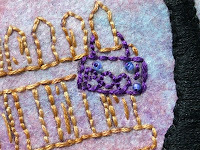 This is a very simple pattern from the British magazine Mary Hickmott's New Stitches. The pattern is one of three that was done for a series of birthday cards. 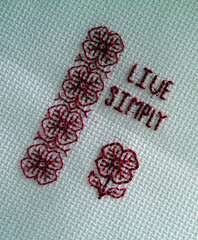 The saying on the original pattern was Happy Birthday, I changed it to Live Simply for the one I stitched. It measures about 2.5 inches by 3 inches. I used DMC number 498 (forgive me I don't know the actual color but it's a cranberry kind of red) and stitched this on 18 count Aida fabric. 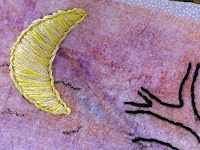 I usually like to stitch on linen or even weave (when I am not stitching on dryer sheets!) but since this was my first try at Blackwork I decided the Aida would be easier to work with. I am stitching a companion one that will say Be Kind. I think I am going to hang them in my bedroom. Perhaps this is the motivation I need to finally decorate our room. We moved in three years ago and have not really done a thing with it. I'm going to try a more complex Blackwork pattern next. We have four pear trees on our property that we planted two years ago. We will get about thirty pears from those trees this year. Our neighbor, Mr. Miller, (he is the gentleman whom we bought the property from) has two very old pear trees on his property. He called me last week and told me that he has never seen them bear this much fruit before. He asked if Andrew and I wanted them? He said that he was never going to eat that many pears. Andrew and I and the girls went over there and picked the pears from his trees. I figured we would get thirty to forty pears. I was wrong, we got a whole bunch more than that! 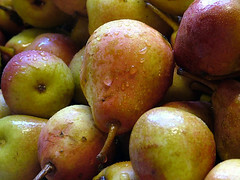 When we were done picking we had filled three five gallon buckets of pears! Andrew is making some pear wine. I will let you know in a few months how that turned out. His father made wine as a hobby for years, mainly apple and boysenberry. He got pretty good at it. So Andrew is going to follow in his father's footsteps and make some wine. I love making jams. 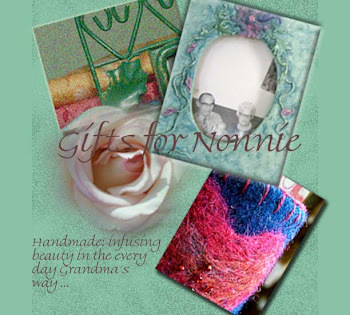 I don't know why, maybe it is because I consider it along the lines of making something by hand and home made. I feel a real sense of accomplishment when I make jam and it turns out well. (I've had some that have not turned out so well!) 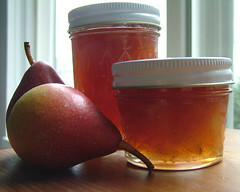 Over the weekend I decided that it was time to dig in to all of these pears and make some jam. I downloaded a recipe for spiced pear jam off of cooks.com and followed most of the recipe. The recipe called for Allspice which I did not have. So I substituted a quarter of a teaspoon of Ginger and half a teaspoon of apple pie spice. This jam turned out so good I was giddy all evening! The only thing I will change the next time I make it will be the amount of sugar I use. (This may ultimately affect the yield but it shouldn't affect the taste.) The recipe called for six cups of fruit and eight and a half cups of sugar. The next time I will cut it down to six or seven cups of sugar. This is a very sweet jam with hints Cinnamon and Ginger. This would be very good warmed over vanilla ice cream. I can't wait to make more. I have a recipe for Winter Pear Butter that I am going to try next. 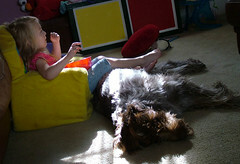 I snapped this photo of Fiona and Hailey (the dog) watching T.V. on Saturday. Fiona was eating popcorn and using Hailey as a living stool. Hailey was very happy to oblige as she got lots of free popcorn in return! The girls lounge on Hailey like this all of the time and Hailey seems to just love it. Fiona goes to pre-school in the afternoons and when I come home after dropping her off Hailey follows me around and whines. It's almost as if she is saying "hey where is Fiona? Where's my baby? She is suppose to be with you". Once Hailey is used to the back to school routine she will stop the whining but boy does she love her girls! Have a great week. Over the weekend my daughter, Fiona, wanted to make brownies. So we got out the Betty Crocker cake mix and were all set to make brownies. Then she had to see this beautiful cupcake "birthday cake" on the back of the box. (For lots of great ideas for really cute birthday cakes go to bettycrocker.com/birthdays, I want to try them all!) 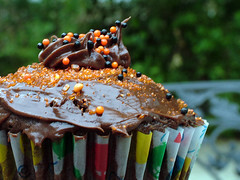 After seeing the "birthday cake" she decided that she wanted to make Halloween cupcakes. Fortunately I had all of the stuff to make cupcakes. With my help she did an outstanding job of decorating her Halloween cupcakes. Of course chocolate is her favorite so they had to be chocolate cupcakes with chocolate icing. I helped her with the icing but the sprinkles and candies are all her doing. I actually enjoy making cupcakes because you don't have to be a pastry chef; no matter what you do to a cupcake it always looks good! There is a Michael's Craft Center in Avon, Ohio, about forty miles east of Norwalk but very near to where my parents live. I stopped in there the other day to look for something for an Aunt who is in the hospital. 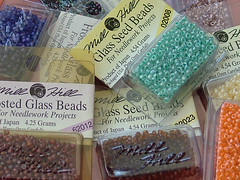 While there I browsed through the needlework department and to my glorious surprise, there, in the one dollar clearance rack were Mill Hill Glass Seed Beads! These beads are normally sold at needlework/cross stich stores and they are not cheap. As you can see I couldn't help myself! I found about eight different types that I really liked and took them up to the cashier. (Mill Hill Beads for a dollar! I was in heaven!) I asked the cashier why they were so cheap and she stated that she wasn't sure why they were marked down but that she had bought herself some the day before. From now on when I am there I am going to check out the clearance section of the needlework department. I walked out of there feeling like I had won the lottery! 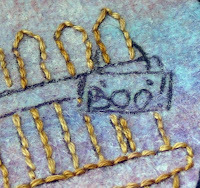 Here is a peek at a Halloween embroidery that I am doing. I am almost finished with it but I have some plans for a frame to go with it as well. 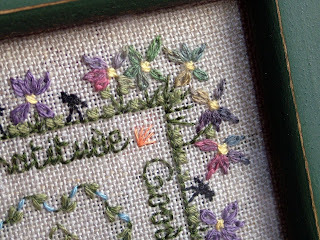 I don't want to post the completed embroidery until the frame is finished too. It might be a week before it is ready to post. I'm excited about it as it is turning out much better than I thought. I drew the design on paper first (which took me three days because I kept erasing and starting over!) then transferred it to my dryer sheet. Once I ironed the dryer sheet to the fusable interfacing I got very excited because the heat from the iron changed the colors of the dryer sheet slightly and created a really nice background for my drawing. Hope you all have a great week and I can't wait to show you my completed project!